I’m trying something new today…a download! Or, downloads, to be exact. 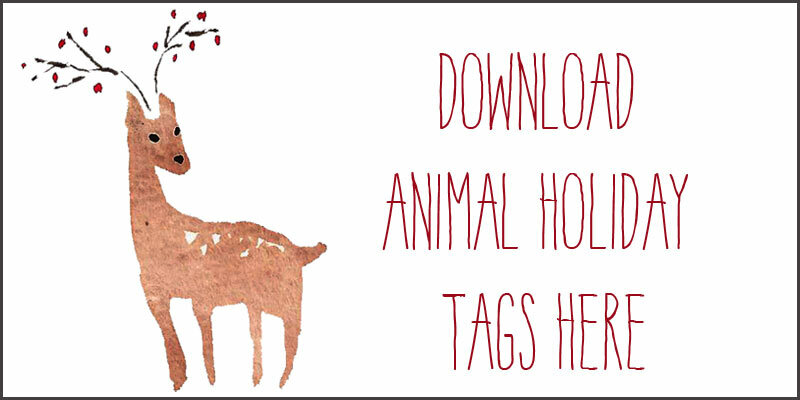 I was doodling with my favorite gouache paints, and thought these illustrations might make some usable holiday tags — what do you think? If you do end up downloading, let me know if anything goes wonky, yes? I printed them up on thicker inkjet paper, and I love them! 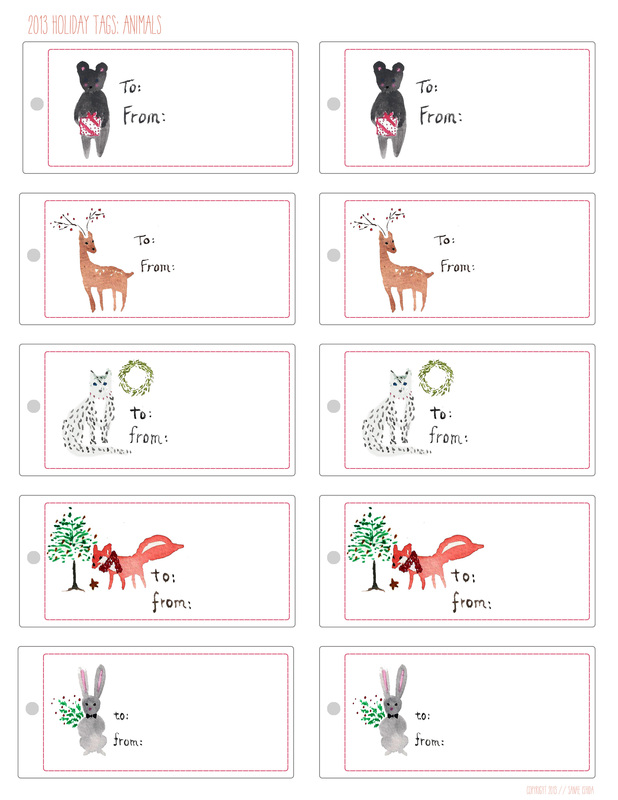 The ones you see above are more Xmas-y and I am especially fond of the deer and the scarf-clad fox. And you figured out that the feline animal is a snow leopard, right? These are the same size as the animal ones, and I don’t know why I shrunk them down for this visual. Anyway, you get the idea. 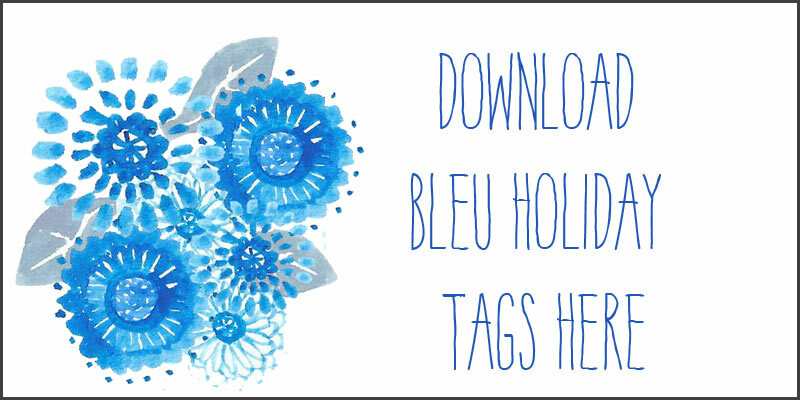 I took inspiration from traditional Japanese indigo pattern motifs, and these could be used as non-holiday gift tags too — bonus! Now, I attempted to get all fancy and made download buttons, and by clicking on the button, you’ll get a hi-res file – I initially tried to make a PDF file, but it was humongo, and I don’t think I have enough bandwidth for it, if that means anything to anyone. These can be printed on 8.5×11 inch standard paper, and I would recommend heavier paper like cover stock or nice matte inkjet paper. There you have it, free tags for personal usage. I’m getting into the holiday spirit, friends! I think i’m going to frame them, a piece of art from Sanae-San. I will definitly use them, i’m going to wrap my presents in plain kraft/red paper (doubleside one) and was searching for something to glam them up. This tags and 3/8″ raw wooden beads thread on bakers twine for tying… sounds good, don’t? So sweet, Marit! 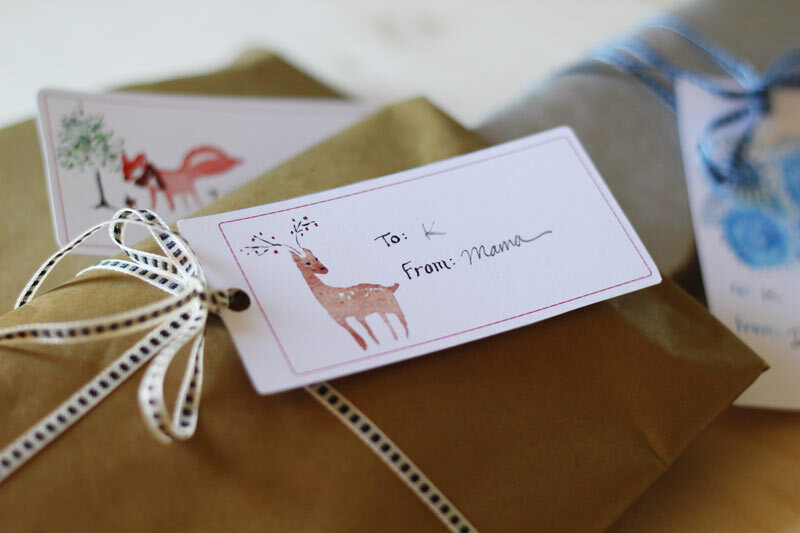 I love your gift-wrapping idea – that would look fabulous! They are beautiful, Sanae! Thank you so much! Thanks so much, Mel! 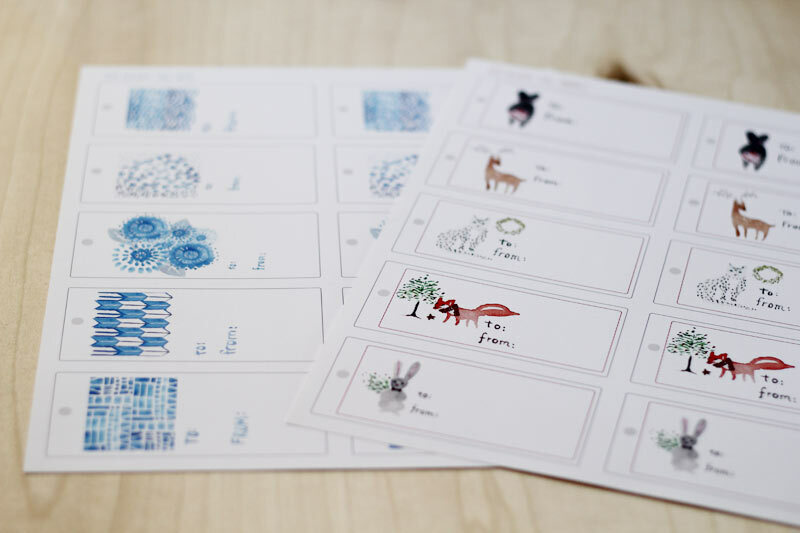 I’d love to do more of these printables – they provide good illustration practice! omg, the 12 days of sanae?! the tags are awesome. 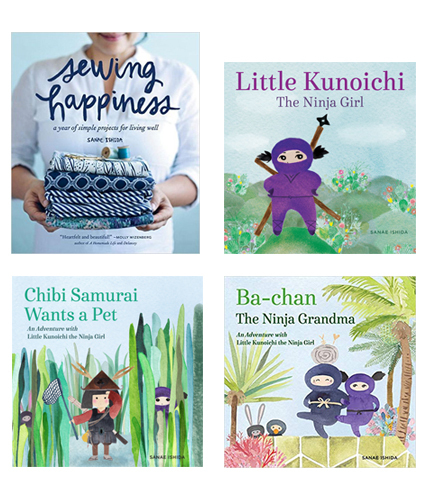 i love the little animals and the indigo prints are beautiful. unfortunately, our second printer in one year was pronounced irrevocably busted yesterday (not the best week for this to happen), but if we can replace it before xmas i will totally partake. thanks! We break our printers all the time too! Why is that? Hope you get a new one soon, and so pleased you like the tags, Ashley! how is it possible that you could get even more awesome-er?! these are stunning! the indigo ones especially speak to me, while my girls will love the woodland creatures. thank you, thank you for your sharing, generous spirit! OK, actually I just figured it out. I can’t print right from the download, but if I save it to my computer first and then bring that up it prints correct size! 🙂 Sorry about that!! Oh so glad it worked! I printed mine up directly from the download as a test and that worked for me, but maybe it’s different for others. Thanks for pointing this out, Kristi!! I had to save it to my computer also for it to print out correctly. Love them! 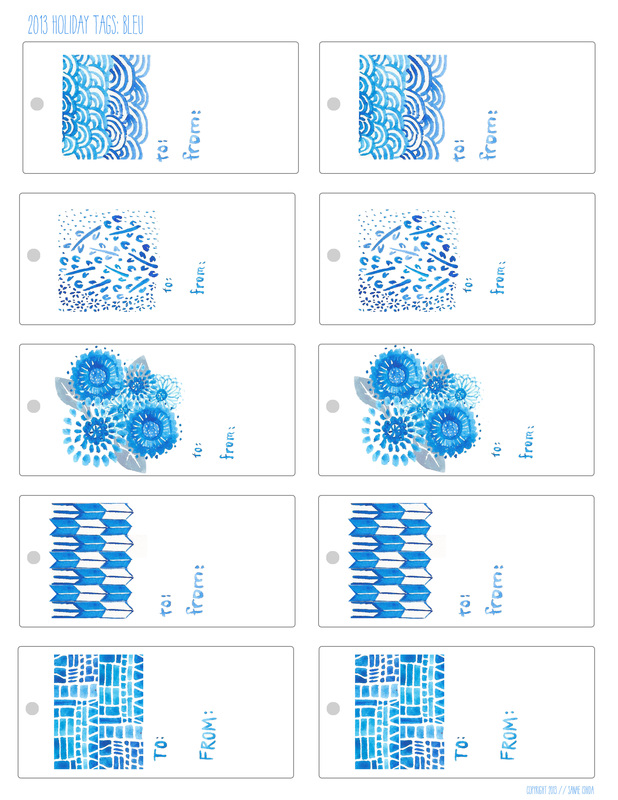 I am completely smitten with the blue and white designs! Yay! Thanks, Morgan – speaks to our roots, eh? Wow, they look really awesome! Thanks so much for sharing those with us! My pleasure, eva maria! So happy with the positive response! Thank you sooooo much for sharing! They are so beautiful. I am in love with the woodland creatures and will try to also use them as cards. And I am using the blue arrow print for the lining of a bag I am giving as a christmas gift and your tag will be the perfect finish!! Kismet! I love the traditional Japanese arrow print – lucky you for scoring fabric with that design! I can’t tell you how happy it makes me that these will be useful to you. Thank you, Ute! Thanks so much, Idoia 🙂 They’re just quick doodles, so I feel a little like I’m getting too much credit for very little work, but my hope was that they could be usable. So glad you like them! Love these!! So cute. If you have bandwidth limitations, can I suggest something like serving the files from dropbox? I’ve been noticing that other people use dropbox for downloads. Hmmmm, my tech un-savvy self will need to figure out how to go about getting that all set-up. Thanks for the tip, Steph!! these are beautiful! i’m excited to print them off in the morning! thank you!! I’m pleased as punch that you like them Venus! Sanae I loooove these! And plan to use them! thank you!!! Yay, so glad you like ’em! Thanks, Kristin! It’s an absolute pleasure, Tracy, thanks for stopping by! Just lovely! Thank-you so much! Found you through ImagineGnats. Lovely gift tags. Thanks so much for sharing your work to make our holidays more special. Thank you!! I’m going to have to do more of these downloads – they’re fun! These are just gorgeous! How I wish I could create art like this. Nicer than any tags I have seen in a store. I would totally buy them! Thanks for sharing. These are so fabulous. Thank you very much for sharing & happy holidays! Thank you, Cybele! Happy Holidays to you too! sanae, these are so awesome! i used them today! thanks so much for making them. you really need to design your own kids fabric line. your illustrations are amazing! thanks again for sharing! Now THAT would be a major dream come true. I would love to design any fabric line! So happy that you were able to use the tags, Rachel! Really nice – I love them. Will use on gifts for sure. 🙂 so good to see you yesterday, Keli! Thought I had already left a message but turns out I didn’t. I love these THANK YOU! They are really lovely :o) Also love your District 12 dress, my kind of dress. Thank you for all the lovely comments, Nicki! Hope the tags come in handy! These are so lovely. Thank you! Love the animal tags. Thank you! Absolutely lovely tags! Thanks so much! I downloaded and opened into Photoshop to add custom printed text to the tags. It worked beautifully and your art work is just amazing. Thank you so much for sharing. These tags are absolutely adorable! Thank-you so much for sharing them! Oh yay, hope you get to use them next year, Carole! Thank you for sharing these tags for others to use! I am printing them out right now to attach to my Christmas gifts for family and friends. They are absolutely lovely! You are very talented and creative. I’m so glad they’re useful to you, Azzia! I appreciate your kind words very much 🙂 Happy holidays! Love these! Thank you! And they printed out just fine. They are so lovely. Thank you for these, they are adorable! Thanks, they are very pretty. These are lovely and perfect for the “Santa Paws” gifts to the family pets! Thank you very much for sharing! Merry Christmas. Thank you so much for these very pretty tags! 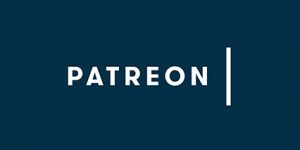 I wanted you to know that I featured them in a little blog series I’m doing. Oops, forgot to say. Post will be live tomorrow. Çok güzeller. Bayıldım bu kartlara. Şimdiden mutlu yıllar.